As part of a multi-agency effort, the Department of Game and Inland Fisheries is continuing to monitor the distribution of nutria in Virginia. 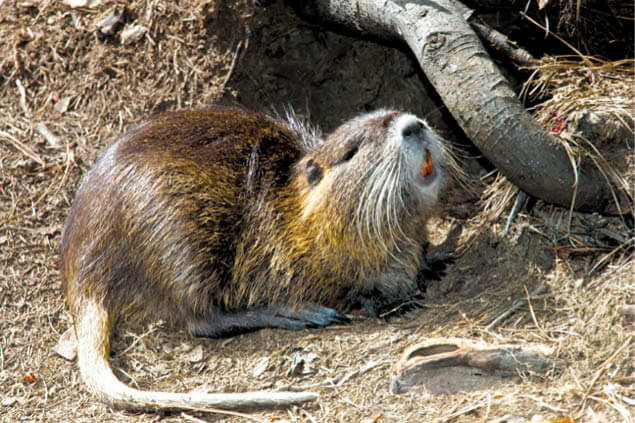 The nutria (Myocastor coypus) is an invasive semi-aquatic mammal native to South America. A casual observer may misidentify a muskrat or beaver as a nutria. Compared to a muskrat, nutria are considerably larger (average 12 pounds), have a round tail, white whiskers, and orange teeth. Nutria cause considerable damage to North American wetlands and are legally defined as a nuisance species in Virginia. Although the current distribution of nutria in the Commonwealth is not completely known, confirmed reports have been limited to areas east of Interstate 95 and south of the James River. Improving our understanding of where nutria occur is necessary to support potential eradication efforts. If you believe you have seen a nutria in Virginia, please visit the website below and report your sighting. The information you provide will assist us with the management of this invasive species: https://cmi.vt.edu/ReportNutria.html.